All eyes and social media comments have been pointed at the PDRA Pro Extreme Motorcycle class as of late. It’s another episode in dragbike racing’s longstanding, quarrelsome turbo vs. nitrous rivalry. 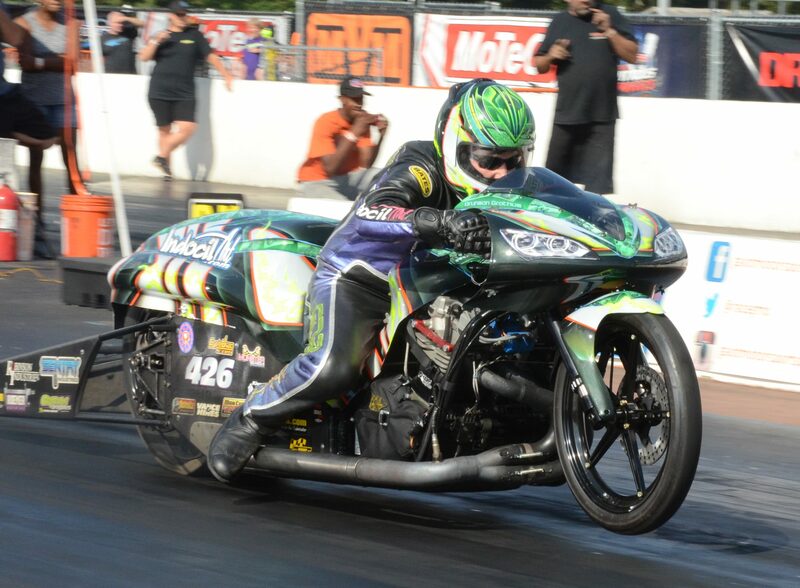 The uproar is in the wake of expert builder Dan Wagner and team shattering the PDRA PXM class record with a 3.91 during a new turbo bike’s debut at the PDRA Fall Nationals from Darlington Dragway, Oct. 5-6. There have been thousands of comments on the Cycledrag.com Facebook page and elsewhere online. Nitrous teams demanded swift action and answers for 2019, with some threatening to boycott the class. In response PDRA President Bob Harris has taken the intercoolers and alcohol fuel away from the turbos, excluding those utilizing mechanical fuel injection. All others must run on gasoline for the upcoming PDRA World Finals from Virginia Motorsports Park, Oct 18-21. The rule update also states rule revisions for this class will be ongoing during the off season. The mechanical injection exception allows an older Funny Bike owned by defending class champion Travis and father John Davis and other bikes using old-fashioned systems to enter without making adjustments. The avant-garde turbos of Ehren Litten and Wagner will suffer the penalty. All turbo engines will also be limited to 1,600 cubic centimeters moving forward. That’s something that will not impact Wagner or Litten. Harris also ruled that he will split the class record up by nitrous and turbo immediately, meaning No. 2 in the points Brunson Grothus and the rest of the nitrous field will still have an opportunity to score bonus points if they can run under point leader Ronnie Smith’s 3.97 NOS record. Turbos would have to beat the 3.91. Wagner boldly trusts nitrous and turbo bikes will be broken up into two separate classes in 2019. Harris says that’s the goal but it is not official or foregone just yet. ADRL champion Meshal Al Saber and tuner Dan “the Man” Wagner. Dragbike racing history – Eric McKinney and Travis Davis run a side-by-side three in PDRA 2017. Harris says his preference is still trying to figure out how to keep the different combinations together for the sake of the show. In the meantime Wagner is preparing his motorcycle for the World Finals, where Terry Schweigert will again be the pilot. Wagner is confidently operating under the belief that turbo and nitrous bikes will not race one another in 2019. Many were unaware that Wagner, the longtime nitrous loyalist who once led the charge of banning turbos from the predominantly nitrous-GS Outlaw Pro Street class, had the objective of using his new state-of-the-art turbo build to change the PDRA rules. This “dream team” motorcycle was built with the goal of being the first turbo bike in the five-second zone in the quarter-mile. Get all the details behind the build and the people involved here. The PDRA was a convenient political stop along the way. Wagner says he’s been racing so long, he’s learned that this was the most effective way to get the change he was after. Wagner says the worst part of making this stand was the criticism he received from nearly everyone in the class. “I get bashed by turbo and nitrous guys now,” laughed Wagner. The key now, Wagner says is for the turbo group that has talked about how many new bikes are being built and how the old Funny Bikes are ready to come join the class to put their money where their mouth is. Only Davis, Litten and Wagner have entered PDRA races on turbo bikes. When adjusting the rules last year Harris was promised many more. Wagner says the claim made last off-season that 10-20 bikes were ready to come compete if turbos were allowed came from one of Litten’s supporters, who was lobbying for the rule change. Wagner points to how quickly he was able to build his turbo bike with the right people and is also urging the long term nitrous and turbo builders to hurry up and be ready for next season, before a lack of participation could kill the class. Harris shared a corresponding observation and said participation from the racers is vital. Harris says he’s even kicked around the wild thought of adding Nitro Harleys to the category. As for Wagner’s new bike owned by Kevin Clark of Virginia, he now eyes the first five-second, quarter-mile turbo run in Man Cup Pro Open and says his team would eventually like to come play with the big boys, Larry “Spiderman” McBride and company in Top Fuel. Terry Schweigert and the state-of-the-art turbo bike headed for Top Fuel? One Top Fuel insider said he does not believe the ultra-light chassis on Wagner’s turbo bike would be suitable for Top Fuel and says he expects the team to slow down when they have to gear the motorcycle for the quarter-mile as opposed to the eighth. Could we see Wagner’s team run fives? Will the machine end up in Top Fuel one day? Will PDRA split the nitrous and Turbos up next year, or will it remain a single class? We love to hear from everyone. Leave your take on this page or on the Cyceldrag.com Facebook page. Either way, it’s great excitement and intrigue for motorcycle drag racing. It’s just what the sport needs – something new to talk about and a reason to get out to a race. You can read about the intriguing build here.